Monday–Saturday 10 a.m.–5 p.m. Sunday 12–5 p.m. Historically, women artists were encouraged by society to take the natural world as their subject. Rather than narrative art, which was thought to require invention and imagination beyond women’s capabilities, subjects such as botanical drawings, still-life paintings and images of animals seemed to require merely the power of observation. Turning this archaic paradigm upside-down, the contemporary artists highlighted in Organic Matters actively redefine the relationship of women, nature and art by investigating the natural world—to fanciful and sometimes frightful effect. Collectively, their work encompasses modern society’s complex relationship with the environment, ranging from concern for its future to fear of its power. Through a diverse array of mediums, including photography, drawing, sculpture and video, these artists depict fragile ecosystems, otherworldly landscapes and creatures both real and imagined. Women to Watch is an exhibition series held every two to three years, developed in conjunction with the museum’s national and international outreach committees. Each of these exhibitions features emerging and underrepresented women artists from the states and countries in which the museum has committees. Organic Matters—Women to Watch 2015 is organized by the National Museum of Women in the Arts and generously sponsored by its participating committees in Arkansas, Southern California, Chile, France, Georgia, Italy, the Greater Kansas City Area, Massachusetts, New Mexico, the Greater New York Area, Ohio, Texas, and the United Kingdom, and by the members of NMWA. Support for Les Amis du NMWA (France) is provided by the GRoW Annenberg Foundation, and support for Gli Amici del NMWA (Italy) is provided by Vhernier. Los Angeles (April 2015) – Los Angeles Artist Jennifer Celio, winner of the 2014 COLA and the 2012 Pollock-Krasner has been chosen as California’s Women to Watch at the National Museum of Women in the Arts exhibition ORGANIC MATTERS- WOMEN TO WATCH 2015 opening June 5th . Jennifer’s works hint at the contemporary issues of environmental degradation and individual self-exploration. Her dense drawings depict seemingly mundane spaces that have been artificially altered or supercharged. Processing seemingly disparate parts into a surreal whole, she derives inspiration from the urban environment, environmental issues and hot button political topics. Jennifer Celio is an artist living and working in Los Angeles. She received a BFA in Drawing and Painting from California State University, Fullerton. Jennifer is the recipient of individual artist grants from the Pollock-Krasner Foundation (2012), The City of Los Angeles (C.O.L.A.) Individual Artist Fellowship (2014), The Center for Cultural Innovation’s Artist’s Resources for Completion grant (2012), recipient of a residency at Yaddo, Saratoga Springs, NY (2014), a nominee for the Rema Hort Mann Foundation’s (NY, NY) L.A. Art Grant Initiative (2013), the City of Long Beach, CA Professional Artist Grant (2010), and the Hoff Foundation (2008). 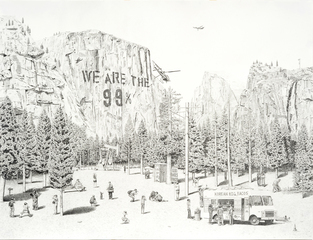 Her drawings have been exhibited in solo exhibitions at Cristine Rose Gallery and Kathleen Cullen Fine Arts in New York City, the Creative Artists’ Agency in Los Angeles, Romo gallery in Atlanta, GA, Bandini Art in Culver City, CA, California State University Dominguez Hills in Carson, CA, and Phantom Galleries in Long Beach, CA. Jennifer’s work was published in Studio Visit (2009) and New American Paintings (2003) and was Shortlisted in the 2008 London International Creative Competition, which also published a book. Her drawings have received critical review in such publications as The Los Angeles Times, LA Weekly, Art Papers, Art Ltd. Magazine, Artillery Magazine, the Huffington Post, Flavorpill, The Orange County Register and The Atlanta Journal-Constitution.